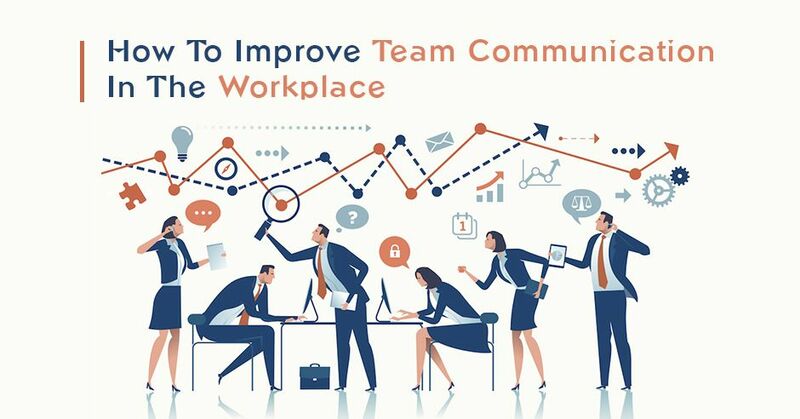 Healthy and unhindered team communication plays a vital role in boosting the productivity and efficiency of any organization. Working in isolation and a silo-type environment will break down the equations between working staff and harm their productivity. Team communication helps in achieving goals in a unified and targeted way. it takes two to tango. No organization can afford to progress without bringing about a collective work culture among its employees. At times communication can get strained due to the pressures of corresponding on multiple platforms to achieve the common objective of work. It is imperative that larger a team grows in number the communication channel should be smarter and smoother, and of course safer. This fosters a strong and binding teamwork for the overall benefit of the entity. This being imperative, it makes a lot of sense to plan ways to improve workplace communication. While this is not easy to achieve, a concerted and focused effort will ensure all the staff is on a single platform, irrespective of the place of work. A few decisive steps enumerated below can help achieve the objective of team building and improving work efficiency levels. Take a look. It pays to build a positive attitude among team members through inclusive strategies. Higher the trust, more open and sincerer will be the exchange of information within the organization. The leader should ensure to have a personal rapport with the team to establish the fair and frank exchange of work-related opinions and viewpoints. Participative working and management style are any days better than working in silos. When do you think you people will open out to you? Is it your wealth, charm or authority? Well, these qualities may rather ‘force’ colleagues and subordinates to be pliant than ensuring a committed and honest response to work. Let your actions stand up and showcase who you are. Lead by example and instill a higher degree of trust among the employees. Show genuine interest in people, empathize with them to elicit fairer relationships to foster work culture. According to several surveys, nearly one-third of employees have a positive abhorrence towards their employers. This feeling of distrust is a stumbling block in achieving harmonious working. A flow of information breaks down in the absence of trust, seriously jeopardizing the working environment. A blanket opinion about the staff is a big no when it comes to managing them. Take time, understand each individually and know their strengths. By understanding each other’s strengths and weaknesses, it’s easier to have effective communication in the workplace. No two personalities resemble fully. Comprehend the subtle variations in moods, responses, and reactions of one and all to varying situations at work. Ability to respect diversity begets positive vibes in the work environment. Respect differing styles of working as long as the ultimate goal is not vitiated by divergent work styles. While some may prefer team chat, some may depend on face-to-face interaction. Factor such preferences wherever possible and feasible to promote seamless communication among and with peers and staff. it is advisable each member is aware of the goals, deadlines, and limitations in the project work sphere. Also, each should be clear of his/her role, responsibilities and duties. Seamless exchange of necessary data across the members will facilitate economy of time as well as the effort of team members. Apart from various psychological perspectives cited above, a unified platform to communicate enhances team communication in the workplace. While choosing such a multi-purpose tool, the choice for entities, thanks to modern technology, is very wide. (iv) cost etc form prime differentiators amongst the multitude of business chat apps available for users. While the trail-blazing and trendsetting apps like Skype offer these and several other features in abundance, it comes at a cost. With the office chat app domain swelling in size over the last few years, several low-cost but high on features and facilities like Troop Messenger have emerged in the market. Group chat for exchanging information with multiple members of a group. File sharing instantly and with ease. Pin chat to avoid multiple scrolling, just pin your favorite or frequent contacts at the top of chat list. Data backup for automatic restoration of data on reinstalling Troop Messenger. Server-side encryption for tight security and privacy of information and data. The unified chat app domain is choc-a-block with business chat apps providing diverse features and catering to myriad needs of users. While most of these team communication tools charge users on a monthly basis, few are available which provide free services with heightened security features. Choose wisely.